Works OK as an introduction for the untrained reader but Could have done with some more pointers to sources that could help understand some of Kant's dense terminology. I think that I'm repeating much of what other reviewers have already noted, but I found the VSI volume on Immanuel Kant to be well worth reading, but also, as expected, somewhat hard going. Roger Scruton, a noted British philosopher, has attempted to summarize and analyze, at least at an initial level, Kant's thought on metaphysics, epistemology, ethics, law, and other issues. The difficulty is that Kant is notoriously difficult to understand, due in part to the depth and abstractness of his thought, his convoluted writing style, variations in translation from his German original works, and changes (not necessarily improvements) in his own explanations of certain chains of argument over the years. 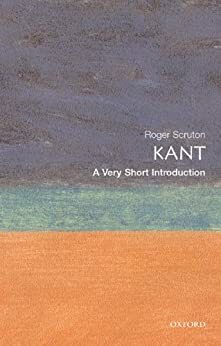 Scruton deals with these issues, directly or indirectly, throughout this book, and I believe he does a very good job of attempting to explain the depth and implications of Kant's thought, but ultimately this Very Short Introduction volume is denser and much harder to follow than similar volumes in the series. Working with Kant's writing demands a great deal of concentration and consistent hard work on the reader's part, so summarizing him always risks being either too superficial (e.g., some popular interpretations of the categorical imperative) or getting almost as complex as the original. I thought Scruton's work tended more towards the latter end of the scale, but I'd rather try to tackle that than the overly simple. Read and enjoy, but be ready for some hard going. Immanuel Kant is arguably one of the most influential, and yet most difficult to read, philosophers of all time. 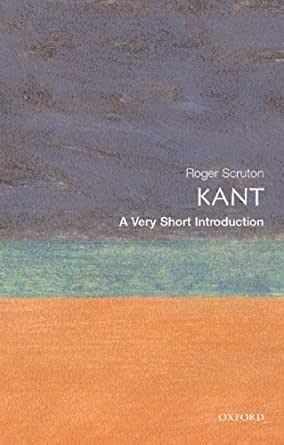 Roger Scruton does as good a job as it is reasonable to expect in this short introduction to Kant's work. The reader is given a bit of background to Kant's philosophy, and then is introduced to the transcendental deduction, the logic of illusion, the categorical imperative, as well as Kant's ideas on aesthetic and law. The booklet concludes with a few comments on the meaning and impact of Kant's "transcendental" philosophy. I must say that the section that gripped (yes, that is the right word!) me the most is chapter 7, "Enlightenment and Law," where Scruton comments on the role Kant had in developing modern concepts such as human rights and even the idea of a league of nations. Kant was an anti-utopian, in the sense that he did not believe that an ideal political system could actually be realized in practice, and indeed despised the violence of the then recent French revolution. (He would certainly not have approved of Bush's war to bring democracy to other countries.) But he was a man of the Enlightenment in the sense that he thought we still ought to strive toward such ideals, to keep them in mind as a guide to our behavior and our discussions about what is right and just. It makes for much food for thought even in modern times. This is a very good book. Very well written by Scruton. I am a big fan of Slavoj Zizek and Jacques Lacan, so i wanted to have a better understanding of Kant. I often read about other philosophers interpreting Kant and I thought it was time I get to know more about him. I have read a small amount of Kant's actual writings and its a bit too laborious for me. Scruton makes aspects of Kant more accessible. This is a very good introduction. I am not an academic philosopher. I read philosophy because it gives me pleasure much as I listen to a Beethoven symphony. From my point of view, it is impossible to have a firm grip on western or eastern philosophy without understanding the critiques of Kant. For an non-academic person, reading the originals of Kant, even in translation, would be an immense barrier. It is much better to read books which introduce Kant to casual readers. There are quite a few books to introduce Kant to casual readers. Unfortunately, every author has his own point of view, and none of them are entirely satisfactory. It is easier to read short introductions on the web before plunging into these introductory books. Viewed from this aspect, this introduction by Roger Scruton serves its purpose. If you are reading this alone, there will still be parts which will appear quite obscure. This is because Kant is a response to rationalists such as Spinoza and empiricists such as Hume. Knowing them first would be an advantage. The good news is that once you have a firm grip on Kant, and has formulated your own ideas, later philosophers such as Heidegger will make much more sense. This is the best explanation of the work of the philosopher who launched the enlightenment and became the main philosopher of the modern and contempory age. If I get to teach a course on Kant, this text will be used because it discusses the value of Kant's philosophy in shaping the progress of intelligent humanity as a projection into the future of human flourishing. His elucidation of Kantian reflection in in its complexity is lucid.